I just finished up some more promo work for Nuclear Dawn (which finally has an official release date of 09.25.2011 and is looking really good) and I should be able to upload that work soon. In between waiting for feedback, etc on the Nuclear Dawn pieces, I was working on this painting that is for a project of my own and tells one of the many stories from within the universe I am creating. 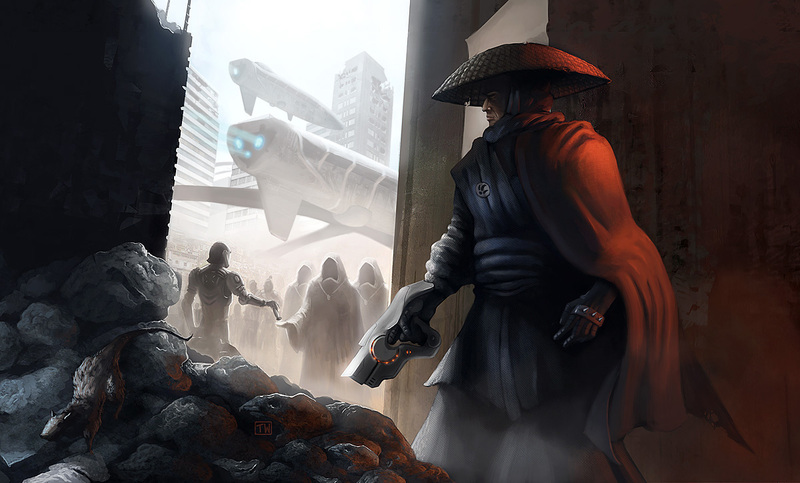 A bounty hunter from a respected warrior clan, watches the crowded market place from the shadows of the alley. His goal; to reclaim a sacred scroll that was stolen from the high temple of his people.